What Exactly is ISDN and How is it Used by Voice Over Talent? ISDN (Integrated Services Digital Network) is a system of digital telephone connections, which enables recording studios anywhere in the United States, Canada and abroad to connect digitally with voice over talent working remotely in their home recording studio. When I use ISDN for a voice over session, it is as if I am standing in my client’s recording booth wherever they are — the quality of sound transmitted is THAT good! The quality is so good, in fact, that the voice over audio is actually recorded by my client’s recording studio in real time during the session. That means that I don’t even have to record the session on my computer. 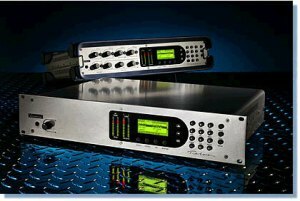 This technology has been around a long time (since about 1986), and even though many people have said it is going to go the way of the dinosaurs because there are now equally fast or faster ways to connect using the internet, ISDN continues to be the standard for remote recording sessions for most recording studios and a large number of voice over talent throughout the world. ISDN, combined with with an affordable home recording studio, are the two primary technological advances that allowed me to move from Southern California, where I used to travel to studios all over Orange County, Los Angeles and San Diego, to where I now live in Michigan. Even though I now live in the Midwest, I can still be connected with all of my studio buddies on the west coast (or east coast or wherever) in a flash and it’s as if I’m right there in their own recording studio! Because we are digitally connected, both parties hear the voice over recording in real-time, with perfect quality. And after the session, there is no need for me to save, edit and upload the final audio files to the producer, since they got everything they needed during the session through the ISDN connection. Can you see why I just love doing ISDN sessions? An ISDN set-up is rather expensive: At least $1500 for the ISDN unit, plus anywhere from $75 to a few hundred dollars per month in phone bills to have your local telephone company provide the ISDN service. I bought my first ISDN unit in 2002 from my longtime ISDN guru Dave Immer at Digifon, and I’ve owned three units over the years (see what I have now on my Studio Specs page). I wouldn’t even think about working without ISDN these days. It’s just too handy and convenient for me, and many of my regular clients rely on it for every session. Another nice feature of my unit is the Phone Patch, which allows anyone to call in from anywhere in the world on their phone and monitor and direct me in the recording session. I still have to record the session on my computer when using a phone patch, but it is the next best thing to ISDN and the ease of use is a win-win, especially since I offer it for no additional charge. A few companies now offer computer software that simulates ISDN units and works through an Internet connection (which means no more expensive monthly phone bills). I’ve considered using this at times, but until things really change on the recording studio and production company end, and I see a real trend of ISDN actually going away or being replaced by something better… I won’t be making any changes with how I connect for remote sessions. It’s just too easy with ISDN! From now through August 15th, 2014 – Take advantage of a 20% Discount on an ISDN Session with me! Debbie Grattan is an ISDN Voice Over Talent who has been a professional VO artist for more than twenty years. She’s been working on stage, screen and behind the microphone for her entire adult life. Check out her voice over talent bio and request a voice over services quote for an upcoming project.